Stockholm University Library (SUB) has been tracking the University’s open access (OA) publishing costs within the local accounting system since 2016. The objective is to gain an overview of the costs and to use this as a basis for decisions about how to proceed in order to support the transition to OA at Stockholm University. This article explains the reasons behind using the accounting system as the primary source of information and describes the workflow of tracking costs and how additional data are retrieved. Basic findings from the 2017 cost compilation are outlined, and the steps taken in 2018, with consequences for both the current workflow and the costs at SUB, are briefly discussed. A breakout session on this topic was presented at the UKSG Annual Conference in Glasgow in 2018. This article is a case study examining one of the activities performed by SUB in support of OA, namely the tracking of OA publishing costs within the University’s local accounting system. While the increasing costs for subscriptions have been discussed for decades (at least within the global library community), until a few years ago, the additional stream of article processing charges (APCs) paid to publishers was not on the radar. This has now changed and the importance for consortia and universities to have a complete overview of the costs involved in subscriptions and OA publishing is emphasized within the OA movement.5, 6, 7 Insight into what is often referred to as the ‘total cost of publication’ is a prerequisite for efficient management of resources. At the consortial level, the cost data is used when negotiating transitional OA agreements with publishers. Even though the corresponding author is usually the one responsible for assuring the publication costs, the APC invoice may be distributed to a co-author at another institution or split by several authors. When the corresponding author has more than one affiliation, it is difficult to determine the paying institution. The actual amount paid may differ from APC list prices due to institutional membership agreements with discounts, eventual editor discounts and more. The local currency issue, whereby if there is uncertainty about the date of payment, the currency exchange rate will not be precise when converting to SEK. In quite a few cases, it is possible to select the currency of the APC, which makes it even more difficult to report the costs in SEK when the original currency is unknown. Although an increasing number of OA publishing costs are centrally managed by SUB, there are still a number of APCs and additional costs managed by local financial staff in the 60 or so departments at SU. Two members of staff, SUB’s controller and a licensing and e-resources librarian are assigned to the task of tracking the costs. The work is ongoing during the year, but with greater intensity during the first months of the year, when the previous year’s accounts have been closed and the final overview is completed. About 50 new records are added per month. Using the invoice number to search the accounting system, the controller looks up each invoice and performs an initial check of all payments. The original amount and currency are registered for each invoice on the spreadsheet and invoices assumed not to be APC invoices are highlighted and any other comments noted. The librarian then reviews all invoices again and complements the spreadsheet with data that cannot be retrieved from the local accounting system: DOI, journal title, hybrid or full OA journal for each invoiced article. This step may be more or less time-consuming, mainly because of insufficient metadata on the publishers’ invoices (recognized as an area for improvement in the ESAC set of recommendations).9, 10 Usually, the journal title and author (sometimes only as a contact in the address) are specified on the invoice. Information like the article title, manuscript number, ‘OA charge’ or similar, DOI/part of DOI and type of CC licence might be added as well, but no publisher provides all these pieces of information. Quite a few invoices have rather sparse specifications and, consequently, are more time-consuming to match with a DOI. In addition, all invoices within the accounting system are scanned images converted to PDFs. This means that the text on the PDFs is not searchable and cannot be copied and pasted. In order to be able to reuse the information specified on the invoice for web searches for the article, text lines must be rewritten in Notepad. DOIs are verified through the short DOI® Service11 and the SHERPA/RoMEO database12 is used for checking the OA status (fully OA or hybrid) of the journal. Invoices incorrectly logged as OA costs are removed from the spreadsheet – mostly additional charges for articles that are not OA. Although there are dedicated accounting codes to be used and the compliance has improved since the codes were first implemented, there are still OA publishing costs registered to other accounting codes (like ‘journal subscriptions’ or ‘other consulting services’). Because of this, supplementary searches per known publisher are done to track OA publishing costs not captured through the monthly reports by account level. Invoice numbers are matched with the invoices listed in the master Excel file, and those not already in the file are added and checked accordingly. This additional work is done at the beginning of the year when the previous year’s OA publishing costs are to be reported. Before completing the final overview, the DOIs are also matched with a bibliometric report (Web of Science) of OA articles with SU researchers as corresponding authors. DOIs not in the master file are checked and a few additional invoices can then usually be tracked in the accounting system. Finally, a small number of DOIs might be added to the master file based on corresponding author data (single author or corresponding author affiliated with SU only), the publishing date of the specific article (as payment of APCs are usually connected to this date) and the APC list price. The assumption is that these are all paid with personal credit cards. Credit card payments are refunded to authors within the University’s payroll system, to which access is restricted to individual institutional administrators only. The refunded amounts are registered in the accounting system using the dedicated accounting codes. SUB’s controller has the authority to pull a report of the total refunded amount in SEK, but since the specifics per payment are unknown, the costs cannot be verified and individual APCs cannot be matched with DOIs etc. by the usual method. The final overview for 2017 contained 437 individual OA articles, at a total cost of nearly €875,000 or 8.5 million SEK. These 437 articles should not be confused with the total number of openly available articles published by authors affiliated with SU in 2017. 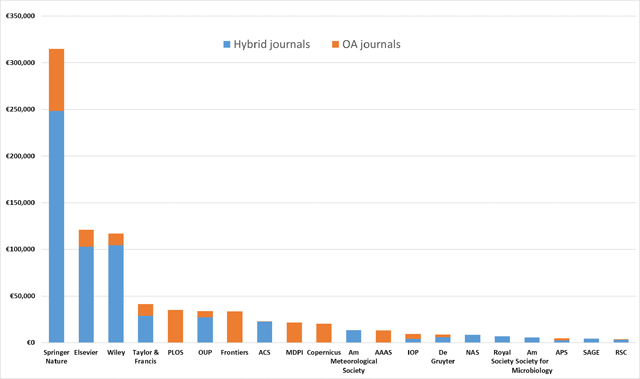 In total there were about 1,100 OA articles by SU corresponding or co-authors published in 2017 issues of individual hybrid or full OA journals.17 The majority of these articles were either paid by a corresponding author at another institution or during a previous calendar year (as payments of APCs are usually connected to the publishing date of the specific article, which is not necessarily the same as the year of the volume and issue where the article is included), waived or published with a business model other than APC. Only articles generating a cost (including articles published within the Springer Compact agreement, which will be discussed below) and where the payment was confirmed or, in a few cases, most likely settled by SU during 2017, were reported. The conclusion can be drawn that the amount €875,000 is to be considered as the minimum amount paid for OA articles at SU in 2017, although close to the actual total amount paid. A small number of additional OA articles paid with personal credit cards may still be missing from the report. When examining the SU data from 2017, the basic findings are consistent with previous studies reporting OA publishing costs and APC levels.18, 19, 20, 21 APCs in hybrid journals are more expensive – at SU the average APC in a hybrid journal is about €2,300 – while the average APC in a full OA journal is about €1,500. The three largest publishers, Elsevier, Springer Nature and Wiley, account for more than half (63%) of the total expenditure on OA publishing costs and four major OA publishers, Copernicus, Frontiers, MDPI and PLOS, are amongst the top ten. The 20 publishers where SU spent the highest total amount on OA publications in 2017 are illustrated in Figure 1. The one thing that might stand out is that Springer Nature, and not Elsevier, is the publisher with the largest share. This is due to the national consortia agreement, Springer Compact. When reporting the OA publishing costs, the University’s individual publishing fee for the Springer Compact agreement 2017 is divided by the number of SU articles (101 in 2017) published within the framework of the agreement. All DOIs with cost per article are added to the compilation. With the additional OA articles in Nature, Palgrave and BioMed Central-branded journals, this means that Springer Nature accounts for the largest share of OA publishing costs at SU. 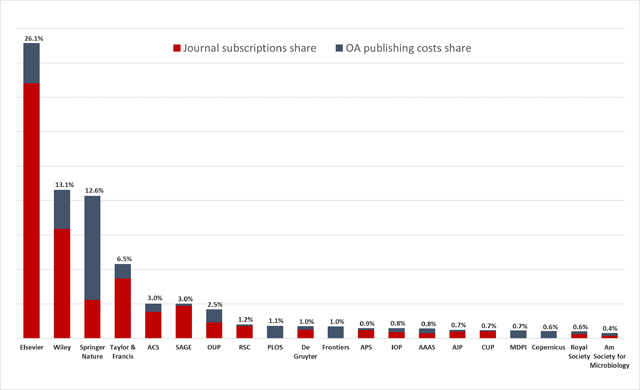 When adding the journal subscription costs to the OA publishing costs, the same three legacy publishers still account for over half of the total expenditure (52%), but Elsevier is now the one with the largest share. Figure 2 illustrates the University’s expenditure per publisher when combining costs involved in OA publishing and journal subscriptions. When making payments through the local accounting system, one of the requirements (when applicable) is to record the funding source. For the majority of invoices paid (just over 90%), the funding source is known. Due to the Springer Compact publishing fee, the Library was the single largest financer (30%) of OA articles in 2017. Adding the APCs paid with the University’s grants, SU financed almost 50% of the OA publishing costs in 2017. The second largest source of funds was the Swedish Research Council (VR), covering 23% of the payments. Without analyzing any further, it is obvious that most of the money paid for OA publishing comes from public funds. However, like VR, quite a few of the other funding agencies are governmental. Looking more closely at who is paying, it can be seen that as many as 90% of the payments are financed with public funds. Figure 3 illustrates the top 10 funding sources of OA articles at SU in 2017. Concerning the Springer Compact agreement, it is worth noting that the NLS and VR have subsidized the agreement with about €1.1 million (during the period July 2016–December 2018).22 This means that the total cost for articles by SU researchers (as well as for all articles by authors at the HEIs within the agreement) is even higher than the individual publishing fee paid by each institution. This does not affect the figures at the SU, though, since only OA publishing costs paid at the University are reported. One strategic decision based on the overview of OA publishing costs per publisher was to enter into new agreements with full OA publishers Copernicus, Frontiers (this agreement has been replaced by a national framework agreement as of 1 July 2018),23 MDPI and PLOS at the beginning of 2018. With these, central invoicing directly to SUB replaced the process of sending single invoices directly to authors. A similar process of central invoicing was set up with Institute of Physics (IOP), where previously the authors had paid the APCs although the total amount spent on APCs was offset against SUB’s licence fee the following year – this within the framework of a national agreement from 2017. In addition, three new national agreements with OA components were reached in 2018, with De Gruyter, the Royal Society of Chemistry (RSC) and Taylor & Francis (T&F).24 This means that SUB from 2018 covers the majority of OA publishing costs connected to SU researchers’ OA publications, in both hybrid and full OA journals. Of the two remaining large publishers, Elsevier and Wiley, negotiations between the Bibsam Consortium and Wiley are ongoing. The goal is to reach a transitional agreement starting in 2019. As for Elsevier, there are currently no formal negotiations under way (November 2018). When the previous agreement was cancelled in July 2018, SU decided that the money saved on Elsevier subscriptions was to be spent on publications in full OA journals. The practice of publishing OA articles in hybrid journals does not speed the development towards 100% immediate OA. Additional central funding to publish in full OA journals is therefore seen as another active step in the efforts to accelerate the transition. With all of these agreements in place, the goal is obviously to increase the number of OA publications at SU. The aim is also a gradual and cost-efficient reallocation of SUB’s acquisition budget to pay for publishing rather than subscriptions. However, to support the University’s researchers in the transition to open science is of most importance. Central funding of OA publications means that SU authors do not have to pay for a growing part of the research published, but above all, it reduces their administration of micropayments to publishers. For researchers at SU, not having to bother dealing with invoices is seen as the most positive outcome of the central funding. Instead, the administration of payments, as well as new challenges that come with the workflows of OA agreements, has fallen upon the Library, as recently illustrated in an article from the Vienna University Library.25 The scope of this article does not cover the additional work of verifying eligible authors and confirming costs to be settled by the Library. But, concerning the monitoring of OA publishing costs at SU, this work has significantly improved with the new agreements and the decision to centrally cover articles in full OA journals. With a growing number of the actual APC invoices managed by Library staff, fewer invoices from the monthly reports need to be checked and matched with a DOI. When the Library pays, all necessary data per article are registered in the master Excel file at the time of payment. In addition to the Springer articles in hybrid journals, likewise, the T&F and RSC articles will be added to the overview when 2018 has ended. In the meantime, through publishers’ dashboards and reports, the number of articles published under each licence can be monitored as they increase during the year. It is clear that one important aspect of central funding is greater cost control and overview of OA publishing costs actually paid at the University. Data from the continuously updated Excel file show that the number of OA articles has increased, along with the OA publication costs, compared to 2017. In addition, SUB’s share of the expenditure is now 57% of total costs (November 2018). Until the cost overview is completed and matched with a bibliometric analysis of all SU publications 2018, it is too soon to say whether this development will be reflected in a substantial increase of the share of OA articles published as well. 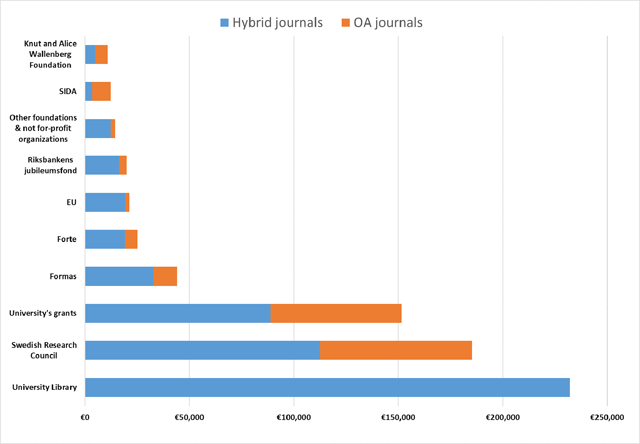 With the yearly report of OA publishing costs, SU has a greater understanding of the OA publishing landscape and its cost implications at the University. How much does it cost, where does the money go and who is paying, are no longer unanswered questions. Based on the findings, SUB has made strategic decisions in order to support the University’s researchers and accelerate the transition to open science. Additionally, SUB has gained better control of the OA publishing costs with centrally managed APC payments and is now in the position to take the next steps towards shifting the acquisition budget to paying for publishing rather than reading. The task of tracking the costs within the accounting system is now an established part of the monthly work performed by the assigned staff. Data collected are continuously used to monitor the development of OA publications at SU and it is an important tool to keep track of SUB’s expenditure when it comes to OA as the Library’s share of the total OA publishing costs is growing. With improved metadata and workflows from the publishers’ side and greater interoperability between systems, the monitoring of costs could hopefully be automated in the future. On the other hand, in a research system with openly available publications, monitoring OA publishing cost at the level of tracking individual APC invoices may very well be obsolete. OA2020: https://oa2020.org (accessed 30 November 2018). Stockholm University Library Business Plan 2018: https://www.su.se/polopoly_fs/1.388962.1528206144!/menu/standard/file/vp18_EN.pdf (accessed 30 November 2018). Wentzel A, 16 May 2018, Sweden stands up for open access – cancels agreement with Elsevier, OpenAccess.se: https://openaccess.blogg.kb.se/2018/05/16/sweden-stands-up-for-open-access-cancels-agreement-with-elsevier/ (accessed 30 November 2018). Stockholm University Library, 29 June 2018, Stockholm University gives researchers more support to get published in full Open Access journals: https://www.su.se/english/library/about-us/press-information/2.42247/stockholm-university-gives-researchers-more-support-to-get-published-in-full-open-access-journals-1.392523 (accessed 30 November 2018). Pinfield S, Salter J and Bath P A, The ‘total cost of publication’ in a hybrid open-access environment: Institutional approaches to funding journal article-processing charges in combination with subscriptions, Journal of the Association for Information Science and Technology, 2016, 67: 1751–1766; DOI: https://doi.org/10.1002/asi.23446 (accessed 30 November 2018). Lawson S, Gray J and Mauri M, Opening the Black Box of Scholarly Communication Funding: A Public Data Infrastructure for Financial Flows in Academic Publishing, Open Library of Humanities, 2016, 2: e10, 1–35; DOI: https://doi.org/10.16995/olh.72 (accessed 30 November 2018). Mathias L, 26 June 2018, The worst of both worlds: Hybrid Open Access, OpenAIRE Blog: https://blogs.openaire.eu/?p=3431 (accessed 30 November 2018). Lovén L, OA publishing Costs Stockholm University 2018 template, File set; DOI: https://doi.org/10.17045/sthlmuni.7265675.v1 (accessed 30 November 2018). Customer recommendations for article workflows and services for offsetting/open access transformation agreements [first draft], ESAC, 2017: http://esac-initiative.org/wp-content/uploads/2017/04/ESAC_workflow_recommendations_1st_draft20march2017.pdf (accessed 30 November 2018). Geschuhn K and Stone G, It’s the workflows, stupid! What is required to make ‘offsetting’ work for the open access transition, Insights, 2017, 30(3), 103–114; DOI: https://doi.org/10.1629/uksg.391 (accessed 30 November 2018). shortDOI® Service: http://shortdoi.org/ (accessed 30 November 2018). SHERPA/RoMEO database: http://www.sherpa.ac.uk/romeo/search.php (accessed 30 November 2018). The National Library of Sweden, Open APC Sweden: A pilot study in cooperation between the National Library of Sweden and Swedish HEIs A national open repository of publication costs for open access articles. Study on behalf of the National Library of Sweden, 2016, Stockholm: http://www.kb.se/dokument/open%20access/Open_APC_Sweden_English_LAST.pdf (accessed 13 December 2018). INTACT Open APC: https://treemaps.intact-project.org/ (accessed 30 November 2018). GitHub repository of the Swedish OpenAPC project, Instructions for data entry: https://github.com/Kungbib/openapc-se/wiki/Instructions-for-data-entry (accessed 30 November 2018). Pieper D and Broschinski C, OpenAPC: a contribution to a transparent and reproducible monitoring of fee-based open access publishing across institutions and nations, Insights, 2018, 31, 39; DOI: https://doi.org/10.1629/uksg.439 (accessed 30 November 2018). Schubert G, Open Access status of articles at Stockholm University 2012–2017, File set; DOI: https://doi.org/10.17045/sthlmuni.5938246.v1 (accessed 30 November 2018). Pinfield S et al., ref. 5. Björk B-C and Solomon D J, Developing an Effective Market for Open Access Article Processing Charges, 2014, London; DOI: https://doi.org/10.5281/zenodo.51788 (accessed 30 November 2018). Shamash K, Article processing charges (APCs) and subscriptions – Monitoring open access costs, 2016, Bristol, Jisc: https://www.jisc.ac.uk/sites/default/files/apc-and-subscriptions-report.pdf (accessed 30 November 2018). Monitoring the transition to open access: December 2017, 2017: http://www.universitiesuk.ac.uk/policy-and-analysis/reports/Documents/2017/monitoring-transition-open-access-2017.pdf (accessed 30 November 2018). Olsson L, Evaluation of offset agreements – report 4: Springer Compact, 2018, Stockholm, OpenAccess.se: https://openaccess.blogg.kb.se/files/2018/10/Evaluation_of_offset_agreements_SC_Report_4-20181008.pdf (accessed 30 November 2018). Wentzel A, 1 June 2018, Sweden commits to Open Science with new Open Access publishing deal with Frontiers, OpenAccess.se: https://openaccess.blogg.kb.se/2018/06/01/sweden-commits-to-open-science-with-new-open-access-publishing-deal/ (accessed 30 November 2018). Lundén A, Smith, C and Wideberg B-M, National licence negotiations advancing the open access transition – a view from Sweden, Insights, 2018, 31, 12; DOI: https://doi.org/10.1629/uksg.413 (accessed 30 November 2018). Pinhasi R, Blechl G, Kromp B and Schubert B, The weakest link – workflows in open access agreements: the experience of the Vienna University Library and recommendations for future negotiations, Insights, 2018, 31, 27; DOI: https://doi.org/10.1629/uksg.419 (accessed 17 October 2018).